James A. Garfield may have been the most extraordinary man ever elected president. Born into abject poverty, he rose to become a wunderkind scholar, a Civil War hero, and a renowned and admired reformist congressman. Nominated for president against his will, he engaged in a fierce battle with the corrupt political establishment. But four months after his inauguration, a deranged office seeker tracked Garfield down and shot him in the back. But the shot didn't kill Garfield. The drama of what hap-pened subsequently is a powerful story of a nation in tur-moil. The unhinged assassin's half-delivered strike shattered the fragile national mood of a country so recently fractured by civil war, and left the wounded president as the object of a bitter behind-the-scenes struggle for power--over his administration, over the nation's future, and, hauntingly, over his medical care. A team of physicians administered shockingly archaic treatments, to disastrous effect. As his con-dition worsened, Garfield received help: Alexander Graham Bell, the inventor of the telephone, worked around the clock to invent a new device capable of finding the bullet. 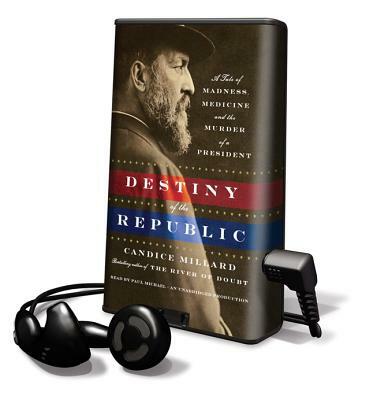 Meticulously researched, epic in scope, and pulsating with an intimate human focus and high-velocity narrative drive, "The Destiny of the Republic" will stand alongside "The Devil in the White City" and "The Professor and the Madman" as a classic of narrative history.